Boris Herrmann and Giovanni Soldini, two ocean heroes from Germany and Italy. Skipper Soldini and Herrmann as a navigator with a ten-member international crew. They tuned specifically for this purpose the 70-foot yacht”Maserati” for that world record challenge. On board: the “easyRESCUE” Nato version. This version has got a double automatic activation. It activates automatically by water contact, but also with a magnetic trigger. Normally the easyRESCUE is assembled into the lifevest and it starts automatically, after the lifevest blows up. Boris and his team do rely on the easyRESCUE. You should do the same. 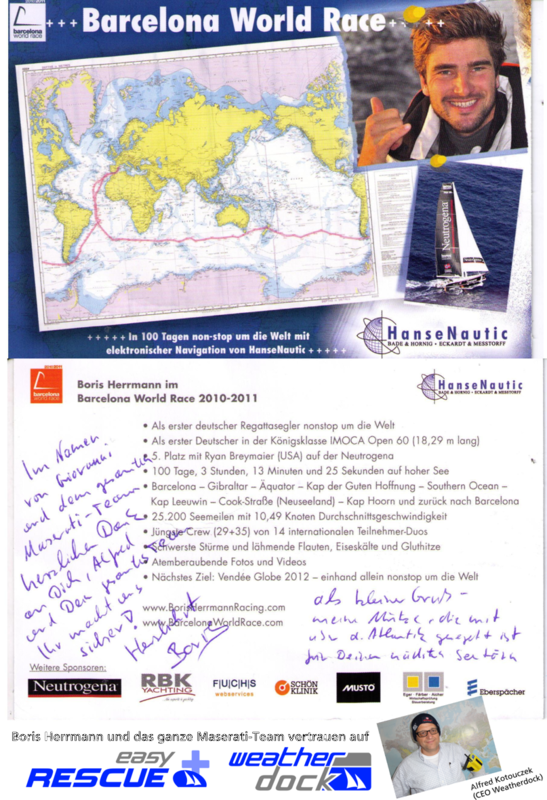 With the following link you’ll find an article on www.segelreporter.com writen by Boris Herrmann himself. You can read his very personal opinion about the AIS S.A.R.T. transmitter.